I love the beginning of Summer, when we see the first green beans in the market along with the first of the season tomatoes. The tomatoes are still a little green or even beginning to “blush”. I am using these “blushing” tomatoes in this recipe. 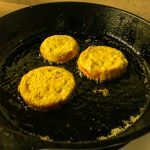 Be sure to keep the corn meal breading light to ensure a crispy crust. I picked up some green beans and tomatoes from Kirkview Farm last week at the market along with some organic corn grits and stone-ground corn meal form Beaverdam Creek Farms. I also used some bacon form Triple L Ranch. 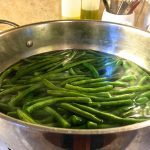 Bring 2 quarts of water to boil and add 2tsp of sea salt, and then the trimmed green bean. Cook for 4-5 minutes until very tender. 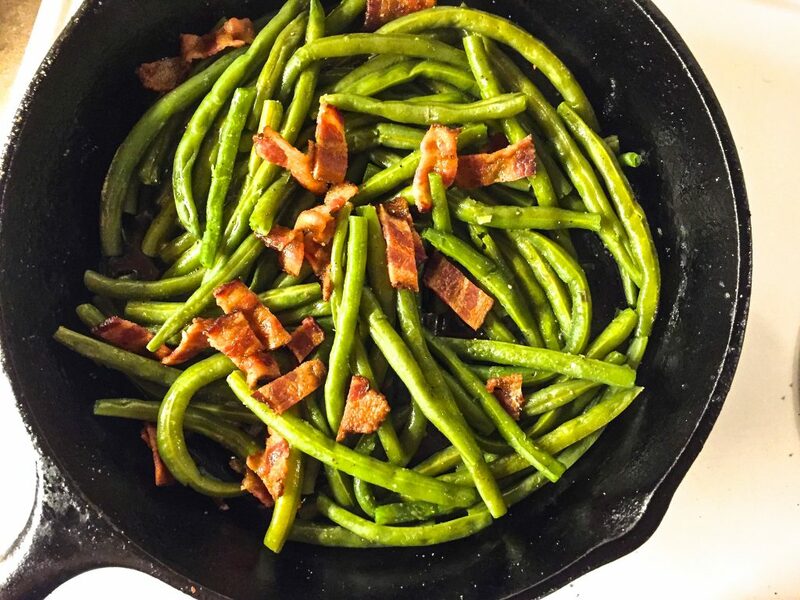 Meanwhile as the beans cook, heat a 10″ iron skillet over medium heat and then add the bacon slices. 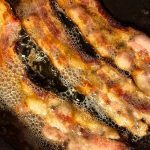 Cook the bacon until lightly crispy, turning down the heat to medium low when the fat begins to splatter. 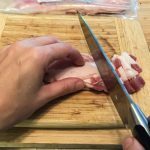 Remove the bacon to a cutting board and rough chop into small pieces. 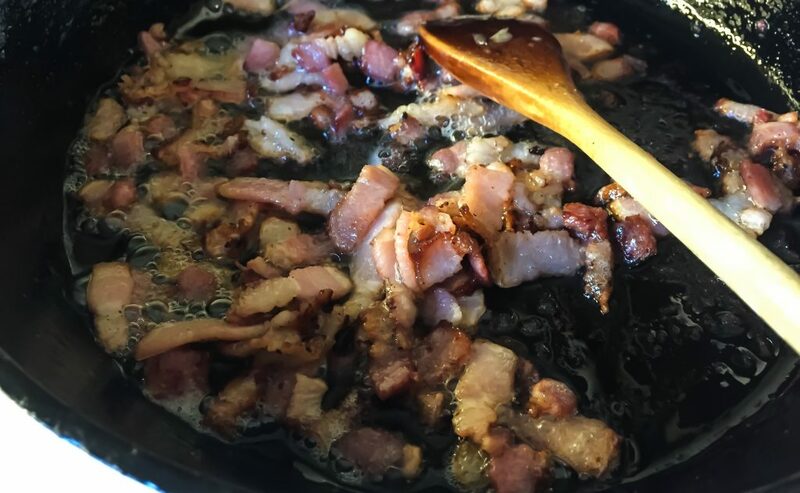 Remove all but 2 tbl of bacon fat from the skillet (be sure to reserve for another use, like making cornbread). Once the beans are cooked drain well in a colander a let the bean steam off excess water for a minute or 2. Once the beans have cooled a bit and are dry, add them to the iron skillet with the reserved bacon fat. Toss well in the warm bacon fat and add the reserved chopped bacon. Season with a pinch of salt and some black pepper and the vinegar. Cook on medium low for 2-3 minutes until the beans absorb some the bacon essence. Remove to a bowl and keep warn until the grits are ready. Dip the slices of tomato in the buttermilk and then coat in the corn meal, set aside until ready to fry. Heat 2 tbls of grapseed oil in the skillet over medium heat and when the oil is hot add the prepared tomatoes. Fry tomatoes for 1 minute on each side until golden. Remove to a plate lined with paper towels and keep warm until ready to serve. Bring the water and milk (if using) to a simmer over medium heat. Add the salt and whisk in the grits. Lower the heat to medium low and continue cooking for 20-30 minutes or until the grits are tender. Drizzle in a bit of the reserved bacon fat and stir. Remove from heat and keep warm until ready to serve. 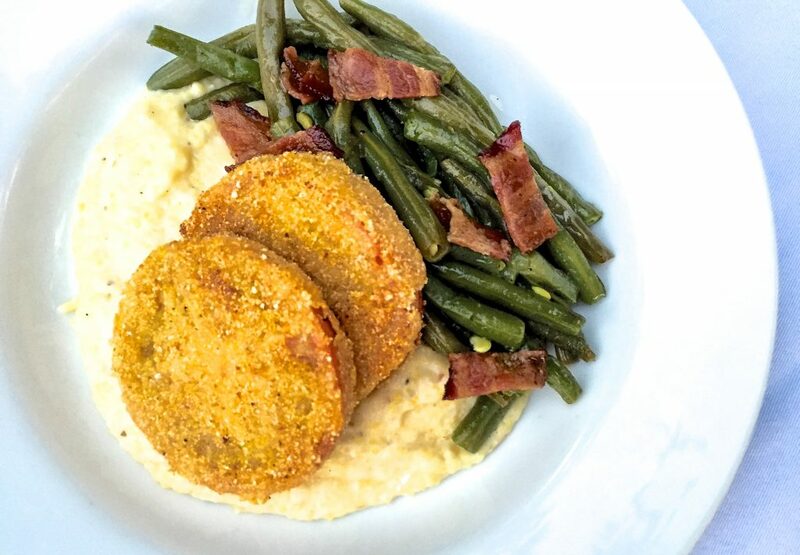 Evenly divide the grits and green beans into 4 shallow bowls and place 2 fried tomatoes in each bowl. Grind a little black pepper over each bowl and serve. Enjoy! This entry was posted in Market Saturday News, Recipes, What's Cooking? on June 24, 2016 . Seeing all the Spring produce at the Franklin Farmer’s Market on Saturday inspired me to share a favorite Spring Salad I’ve enjoyed for years. While we were whipping up kale salads for the first chef’s Saturday last weekend, we had the chance to get out and see what was fresh from our local farms. We had a great visit with Adam from Colvin Family Farm in Spring City, TN who grow amazing produce naturally without synthetic chemical fertilizers, pesticides, herbicides or GMO seeds. Their vegetables are beautiful! 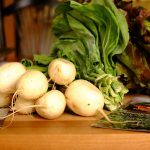 We chose a bunch of fresh collards, young Snow White turnips and ruby red lettuce for our recipe this week. We also picked up some amazing bacon from Triple L Ranch to bring in a nice smoky bite. And to finish it all off we topped this dish with a delicious soft cooked organic farm egg from Bloomsbury Farm. 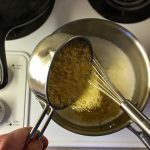 The recipe may seem challenging but it’s really simple using only a small pot and a cast iron skillet. Don’t be afraid, give it a try and be sure to get to the market early this week to get the good stuff! Oh and a special thank you for all of you that stopped by the South Fork Catering Co. tent to try our spring salad recipe last Saturday! We love our buying from our farmers, so be sure to shop local this weekend! Soak the lettuce in cool water for 30 minutes, then trim the leaves and set aside. 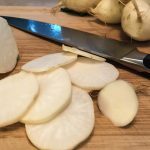 Slice the turnips into thin rounds and reserve. 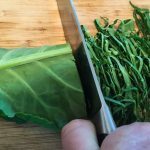 Trim the the stems off the collard greens and then stack the leaves and then slice cross wise into 1/8 inch ribbons, set aside. Warm a cast iron skillet over medium heat for a few minutes then add the bacon. Cook the bacon until crispy, stirring often. Add the sliced shallots to the pan and cook with the bacon for 1 minute. When the bacon and the shallots are ready reserve in a small bowl along with the bacon fat. Return the skillet to the heat and add the sliced turnips. Only lightly wilt the turnips by stirring them for 1 minute, Remove the turnips to a plate and return the skillet o the heat. 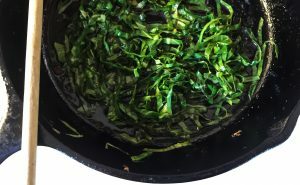 Add the olive oil and sliced collards to the skillet and cook over medium heat for few minutes until the collards have wilted. Season with a little salt and black pepper and then add the vinegar. Turn off the heat and keep in the pan until ready to serve. While you are cooking the bacon, turnips and collards in the cast iron skillet, bring 2 quarts of water to simmer in a small sauce pan, then carefully add the whole eggs and cook for 6 minutes. ( You can cook them for 7-8 minutes for firmer yolks) When the eggs are cooked remove them with a slotted spoon to a bowl of cool water. leave in the water for a few minutes and then carefully peel the eggs and set aside. The eggs will be really soft so be careful to to break them! Divide the trimmed lettuce leaves among 4 large plates. Evenly distribute the wilted sliced turnips among the 4 plates between the lettuce leaves. Then make little nests of collard greens in the middle of each plate. Carefully place the soft cooked eggs in the collard nests, then season each one with a tiny amount of salt. 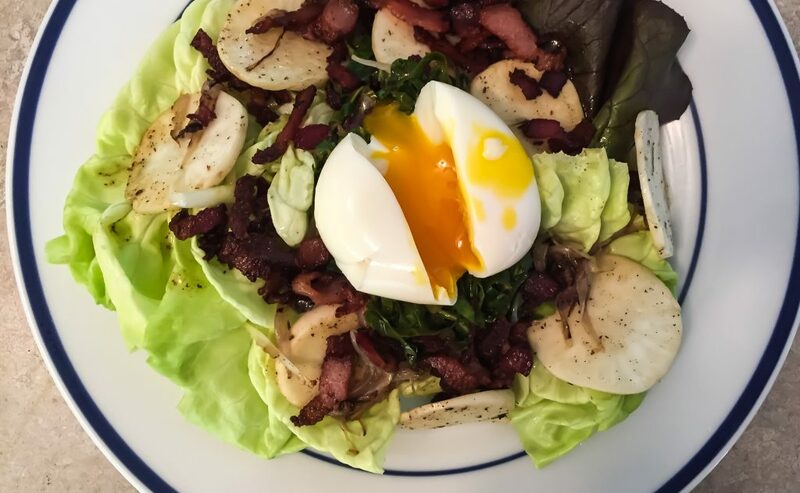 Using a spoon divided the crispy bacon and shallots between the salad plates and spoon the reserved bacon fat over the lettuce leaves. Grind some fresh black pepper over each salad and serve. Now’s time to simply enjoy a wonderful spring salad, all locally grown, from Tennessee farms. Bon appetite! 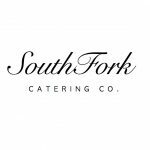 Chef Michael Martin is owner and chef of South Fork Catering in Franklin Tennessee. This entry was posted in Market Saturday News, Recipes, What's Cooking? on June 3, 2016 .